Ramattan News Agency published this account of the last minutes of a five month old baby who died in Gaza City on Thursday (28 February) in a second airstrike in recent weeks on the supposedly abandoned Ministry of Interior building: ” ‘The baby sucked milk, he was playing with his mother, I was reading a book when a rocket hit Ministry of Interior’, the father, Nasser Al-Boraiy, said. With the first rocket, the electric power was cut off; darkness filled the …house. Stones and pieces of the asbestos ceiling poured on the head of the laughing baby. The explosions continued as two other rockets hit the building. ‘I looked for my baby in darkness between the ruble, I did not realize where is he, when he cried a once, I followed the direction of his voice’, the father said. ‘My hands touched my baby who was breathing hard, I felt a warm liquid on my two hands to realize that he is wounded’, Nasser Al-Boraiy said”. 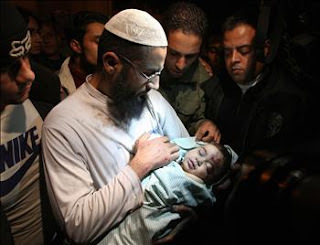 The baby was killed by the shrapnel of an Israeli missile. The Ramattan report continued: “The father carried his baby to the nearby Shifa Hospital, blood was streaming from his tiny head. In the hospital, the father went in a panic of hysteria to realize that his sole baby was killed. The tears showered the face of the father when he saw the shoes of the baby. The mother of the baby was shocked when she realized that she lost her baby, she fall unconscious, she laid on the bed at the reception department while her baby was in the morgue. On Thursday morning, she strongly cried when she saw the ’empty’ bed of her baby, after arrived in the house from the hospital”. In this report from Gaza, Ramattan addes that “Mohammed Al-Boraiy is not the sole child who was killed in the Israeli series of air rids across the Gaza strip, three others were also killed on Wednesday evening in the northern Gaza Strip town of Jabalya. Medics reported that Anas Al-Manama, 10, Bilal Hijazi, 11, and Mohammed Hamada, 11, were killed in Jabalia last night in an Israeli Air Strike”. This report can be found online here. Twenty Palestinians were killed in Gaza today, and several in the West Bank as well. The student, 47-year-old Roni Yehiye, father of four, who was receiving vocational re-training, died of his wounds on the spot. The photo below shows his son mourning during the funeral. “Interviewing Abu-Qusay, the spokesman of Al-Aqsa Brigades in Gaza, in June 2007, I asked him about the rationale for firing Qassam missiles at the Israeli town of Sderot. ‘The army might respond’, I said, not realising that I was already biased. ‘But we are responding here’, Abu-Qusay said. ‘We are not terrorists, we do not want to kill . . . we are resisting Israel’s continual incursions into the West Bank, its attacks, its siege on our waters and its closure on our lands.’ Abu-Qusay’s words were translated into Hebrew, but Israel continued to enter the West Bank every night and Israelis did not find any harm in it. After all it was only a response. “Another interesting distinction between us and them came up when Hamas demanded the release of 450 of its prisoners in exchange for Gilad Shalit. Israel announced that it would release prisoners but not those with blood on their hands. It is always the Palestinians – never the Israelis – who have blood on their hands. This is not to say that Jews cannot kill Arabs but they will not have blood on their hands, and if they are arrested they will be released after a few years, not to mention those with blood on their hands who’ve gone on to become prime minister. And we are not only more innocent when we kill but also more susceptible when we are hurt. A regular description of a Qassam missile that hits Sderot will generally look like this: ‘A Qassam fell next to a residential house, three Israelis had slight injuries, and ten others suffered from shock.’ One should not make light of these injuries: a missile hitting a house in the middle of the night could indeed cause great shock. However, one should also remember that shock is for Jews only. Palestinians are apparently a very tough people. “This phenomenon, in which IDF statements are directly translated into media reports – there are no checkpoints between the army and the media – is the result both of a lack of access to information and of the unwillingness of journalists to prove the army wrong or to portray soldiers as criminals. ‘The IDF is acting in Gaza’ (or in Jenin, or in Tulkarm, or in Hebron) is the expression given out by the army and embraced by the media. Why make the listeners’ lives harder? Why tell them what the soldiers do, describing the fear they create, the fact that they come with heavy vehicles and weapons and crush a city’s life, creating a greater hatred, sorrow and a desire for revenge? “Last month, as a measure against Qassam militants, Israel decided to stop Gaza’s electricity for a few hours a day. Despite the fact that this means, for instance, that electricity will fail to reach hospitals, it was said that ‘the Israeli government decided to approve this step, as another non-lethal weapon.’ Another thing the soldiers do is clearing – khisuf. In regular Hebrew, khisuf means to expose something that is hidden, but as used by the IDF it means to clear an area of potential hiding places for Palestinian gunmen. During the last intifada, Israeli D9 bulldozers destroyed thousands of Palestinian houses, uprooted thousands of trees and left behind thousands of smashed greenhouses. It is better to know that the army cleared the place than to face the reality that the army destroys Palestinians’ possessions, pride and hope. “Another useful word is crowning (keter), a euphemism for a siege in which anyone who leaves his house risks being shot at. War zones are places where Palestinians can be killed even if they are children who don’t know they’ve entered a war zone. Palestinian children, by the way, tend to be upgraded to Palestinian teenagers, especially when they are accidentally killed. More examples: isolated Israeli outposts in the West Bank are called illegal outposts, perhaps in contrast to Israeli settlements that are apparently legal. Administrative detention means jailing people who haven’t been put on trial or even formally charged (in April 2003 there were 1119 Palestinians in this situation). The PLO (Ashaf) is always referred to by its acronym and never by its full name: Palestine is a word that is almost never used – there is a Palestinian president but no president of Palestine. ” ‘A society in crisis forges a new vocabulary for itself,’ David Grossman wrote in The Yellow Wind, ‘and gradually, a new language emerges whose words . . . no longer describe reality, but attempt, instead, to conceal it.’ This ‘new language’ was adopted voluntarily by the media, but if one needs an official set of guidelines it can be found in the Nakdi Report, a paper drafted by the Israeli Broadcasting Authority. First set down in 1972 and since updated three times, the report aimed to ‘clarify some of the professional rules that govern the work of a newsperson’. The prohibition of the term East Jerusalem was one of them. “The restrictions aren’t confined to geography. On 20 May 2006, Israel’s most popular television channel, Channel 2, reported ‘another targeted assassination in Gaza, an assassination that might ease the firing of Qassams’ (up to 376 people have died in targeted assassinations, 150 of them civilians who were not the target of assassinations). Ehud Ya’ari, a well-known Israeli correspondent on Arab affairs, sat in the studio and said: ‘The man who was killed is Muhammad Dahdouh, from Islamic Jihad . . . this is part of the other war, a war to shrink the volume of Qassam activists.’ Neither Ya’ari nor the IDF spokesman bothered to report that four innocent Palestinian civilians were also killed in the operation, and three more severely injured, one a five-year-old girl called Maria, who will remain paralysed from the neck down. This ‘oversight’, revealed by the Israeli journalist Orly Vilnai, only exposed how much we do not know about what we think we know. “Interestingly, since Hamas took over the Gaza Strip one of the new ‘boo’ words in the Israeli media is Hamastan, a word that appears in the ‘hard’ news section, the allegedly sacred part of newspapers that is supposed to give the facts, free from editorialising. The same applies to movements such as Hamas or Hizbullah, which are described in Hebrew as organisations and not as political movements or parties. Intifada is never given its Arabic meaning of ‘revolt’; and Al-Quds, which when used by Palestinian politicians refers only to ‘the holy places in East Jerusalem’ or ‘East Jerusalem’, is always taken by Israeli correspondents to mean Jerusalem, which is effectively to imply a Palestinian determination to take over the entire capital city” … This excellent article can be read in full here. The Central American nation of Costa Rica has said it is recognizing the State of Palestine. In reaction, Israel Today reports, “Israel on Tuesday indefinitely postponed a planned meeting between Costa Rican President Oscar Arias and a top Israeli diplomat. Costa Rican Foreign Minister Bruno Stagno said that his nation’s February 5 decision to establish official ties with the ‘state of Palestine’ was meant to encourage accelerated peace talks between Israel and the Palestinians. Previously warm relations between Israel and Costa Rica began to cool last year when the Central America nation decided to move its embassy from Jerusalem to Tel Aviv. In 1982, Costa Rice was one of only two nations to spurn an international decision to pull out of the Israeli capital in response to Israel’s official annexation of a united Jerusalem”. This article is posted here. The donors run everything, and everything is geared to the donors. Never mind that it has already been several years since staff of the non-governmental organizations working here have come to the conclusions that they fund, while Israel destroys. “Question: To judge from your writings you don’t appear to place much stock in the potential of non-governmental organizations (NGOs) to effect change. Answer: I don’t. In the first place, I don’t call them NGOs, I call them WGOs—Western Governmental Organizations. Some of them do decent work but by and large what they do is to buy up lots and lots of people in these countries who are not then engaged in any form of political activity or social movements, who basically pay themselves salaries, run small offices, and go on demonstrations chanting, ‘Another world is possible’. And I don’t think that’s particularly helpful, and I think increasingly now people are beginning to see through the NGO-ization process”. This comment is part of an interview with Tariq Ali published here.